The second in an amazing series from modern worship leaders like Robin Mark and Stuart Townend, exploring the legacy of classic hymns. Thousand of worshippers sing classics like 'Crown Him with Many Crowns' and 'In Christ Alone'. 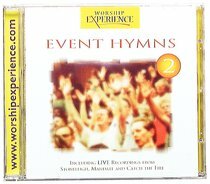 About "Event Hymns 2 (Worship Experience Series)"